A friend and I decided to start a day early with a trip out for breakfast. 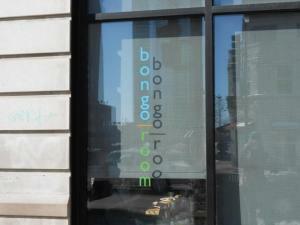 I’ve passed the Bongo Room on several occasions but hadn’t been in. We got there early on a Sunday. The line in front of us didn’t last long. Bongo Room’s pancake list is that of a super sweet and rich kind. 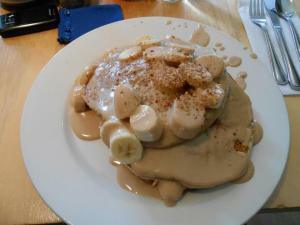 I ordered what seemed the safest, a stack of banana hazelnut pancakes. I think I was expecting a dollop of hazelnut cream on the side of my banana pancakes and a small amount of the candied praline. Instead the hazelnut was drizzled over the plate like a syrup. it wasn’t bad, just really rich. 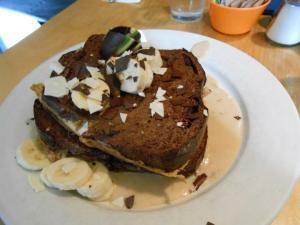 My friend got their seasonal chocolate french toast. Both of us had difficulty with our rich breakfast. I barely ate a fourth of it. I think in my case the banana pancakes were delicious, a bit like banana bread but the hazelnut cream sauce was just too much for me. 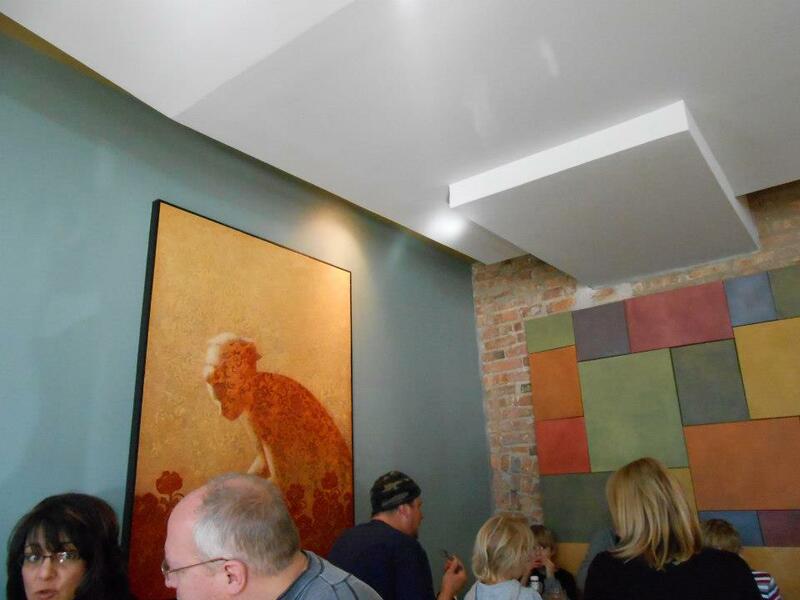 The overall atmosphere was nice, our waiter was friendly, though we couldn’t really tell who were workers and who were just wandering around. They were all wearing jeans and t-shirts so I’d occasionally wonder why other patrons were refilling my water-glass until I realized they were working. The level of sound occasionally fluctuated, my friend and I both tend to be soft spoken so we would have to wait until the sound levels went down again to hear one another, but that was just because of how busy it got. I may go back to try their eggs because I always hear good things about the Bongo Room, but their pancakes were just too rich for me.